mesh produce bags. They have great texture and the color is so perfect for a home sweet homemade valentine. They’re little bit lacy. If you squint your eyes. Isn’t this the cutest thing? 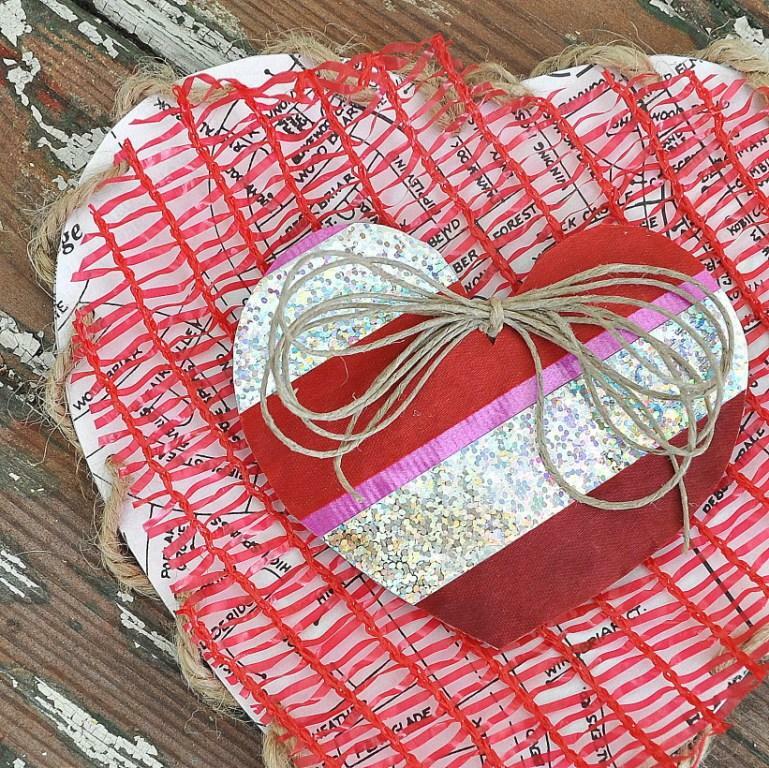 Recycled paper topped with the mesh topped with a cardboard heart covered in stripes of ribbon. It’s my favorite so far. The paper beneath the mesh is a community map enclosed in our monthly civic association newsletter. [HOA dollars at work!] I’ll be making more valentines like these – they’re so stinkin cute. This valentine is for my sister-in-law. Thankfully she doesn’t read this blog 🙂 She loves blue and silver. I sandwiched two layers of white tulle, as a lace alternative, between the aluminum foil heart and the paper hearts. Last weekend when I was working on cross stitching I knew as soon as I finished the blue and silver heart I had to fashion it into a valentine for her. It’s sort of the great thing about making your own valentines. Just layer together what you have…more is definitely more. Diane, these are so stinkin’ cute is right! HA! I squinted my eyes and you’re right….they do look lacy!! LOVE the one you made for your sister-in- law. I really like the soft colors and your ingenious use of tulle. I adore tulle! Once again, thank you for sharing your creativity, my friend. Always enjoyed and inspiring! Hope you’re having a flawless weekend! Oh, you are a clever one! And I’m pretty sure that x-stitched one will hit the mark with the sister in law just fine. I really like the cross stitching! What a great upcycle for that red faux lace!! That’s so cool! I love it! Thanks for linking up with us at the Find Some Love Fest!! S0 cute! We have had so much fun with the Find Some Love Fest link up! It’s a great way to connect and support fellow bloggers. We would love for you to visit our blog. literally love these valentines. seriously. you go girl.